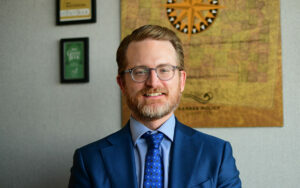 Kansas Policy Institute is pleased to announce that Kansas native Sam MacRoberts is joining us as General Counsel for our new public interest litigation center – Kansas Justice Institute. Through education, advocacy, and litigation, KJI will work to limit the size and scope of government. We’ll represent people who can’t afford on their own to prevent government from interfering with their constitutional rights. * There’s a proposal to eliminate the requirement for proof of citizenship to vote. * Cities and counties want to set minimum pay and benefit levels for employees of private employers in their jurisdiction. * Unions want to make teachers and other public employees pay dues even if they don’t join the union. Sam MacRoberts was recently hired as the General Counsel and Litigation Director for the Kansas Justice Institute. He is responsible for developing and implementing the Institute’s comprehensive litigation strategy. Sam was raised in Leawood, Kansas. He earned his Political Science and Juris Doctor degrees from the University of Kansas.